The man, whose identity has not be confirmed, was said to had armed himself with a gallon of petrol and lighter and started narrating how Nigerians were going through hardship. “I was Gate when I saw a crowd and I stopped to make enquiries. I saw a young man in his 20s; he was armed with a gallon of fuel. He was shouting on top of his voice saying that he was tired of life. He narrated how he had been running from one person to other for assistance and everyone was saying things were difficult. He told people who cared to listen that the country was under a spell that cannot be cleansed. The Police public relations officer, CSP Chike Oti, who confirmed the story, said the man was being treated at the Lagos State Emergency Centre, 7-Up area. 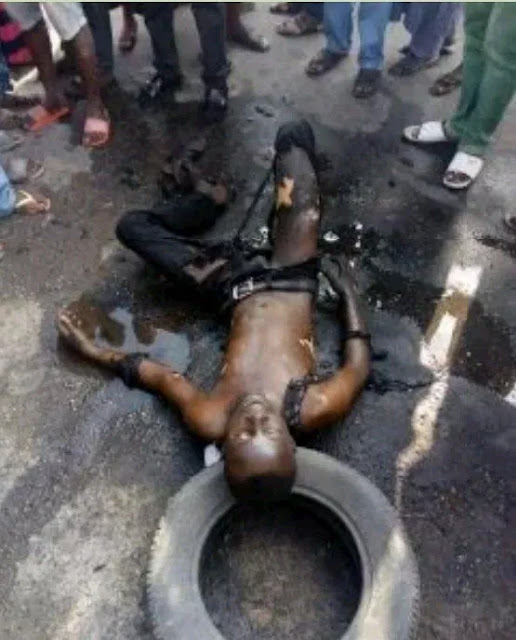 “Divisional Police Officer, Ojodu, received a distress call that a man set himself ablaze and raced to the scene with some officers. When the police arrived, they put out the fire and rushed the man to the Lagos State Emergency Centre, where he is being treated. The man is still unconscious as he received third-degree burns. He is still unconscious as I am talking to you, but the Commissioner of Police has directed the DPO in charge of Ojodu to take the man who attempted suicide to the hospital.